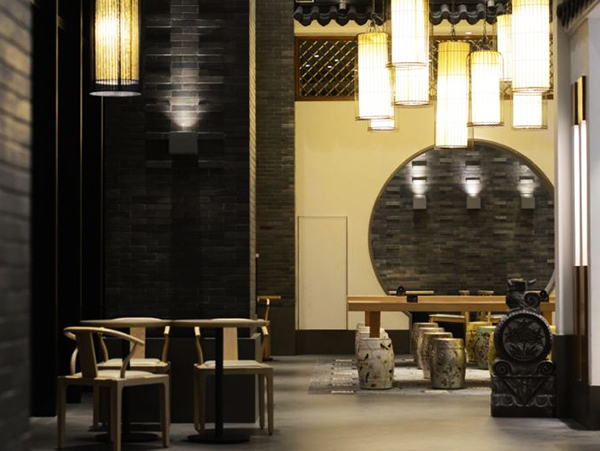 The restaurant is much like so many others across the country, designed tastefully to look likea classical Chinese garden. The main dining space, surrounded by green bamboo, is generously filled with flowers, has amoon-shaped doorway, and is decorated in Great Wall gray and jade. But what's surprising is that it's actually owned by one of biggest names in global fast food: Yum Brands Inc's KFC. And it's been completely designed digitally, in collaboration with BaiduInc, the Chinese web services giant. Located inside Shanghai's National Exhibition and Convention Center, the "Original+" conceptoutlet offers customers a digitalized experience, covering everything from ordering to paying, as well as other types of entertainment. Joey Wat, CEO of KFC China, said "Original+" combines both the company's "OriginalRecipe" chicken and innovative technologies. Consumers place their orders using Baidu's virtual personal assistant, Duer. Other technologies used include upgraded automatic ordering machines and Music ChargingTables, where customers can place cellphones capable of wireless charging inside a chargingarea, so that while the devices are being energized, their owners can relax by enjoying a listof songs customized by BaiduMP3 for the store. KFC sees the development of the concept store as a move to reposition itself to keep up withthe latest in social and consumer demands, by encompassing the internet and mobileservices, particularly to attract the younger generation. "The KFC concept store is a very interesting experiment," said Jason Yu, general manager ofthe consumer research firm Kantar Worldpanel China. "It is expected to generate increased customer experience, and raise efficiency forrestaurants. "And in turn it is expected to attract more young and middle class customers." The advent of such high-tech dining, however, is not expected to fully offset arguably thebiggest challenge being faced by the fast-food industry: Chinese consumers increasinglyopting for healthier eating, within an array of different choices, he said. Another fast-food chain, McDonald's Corp, meanwhile, is also betting big on digital growth. It has already unveiled its Experience of the Future restaurant, which offers digital, personalized and customized experiences. This year the global fast-food giant will also upgrade its 150 Create Your Taste restaurants infirst-tier Chinese cities, offering digital services and do-it-yourself burgers. Also the owner of the Pizza Hut and Taco Bell, the China unit is Yum's top profit-driver. Theunit's planned sale has garnered intense interest, attracting high-profile potential suitors andsparking speculation it will fetch a rich valuation. A consortium backed by sovereign fund China Investment Corp has already expressedinterest in buying a majority stake. Yum said last week that sales at its China restaurants open at least a year rose 6 percent inthe first quarter. Its KFC restaurants, the majority of its 7,205 stores in the division, posted a12 percent rise in same-store sales, while the smaller Pizza Hut Casual Dining posted a 12 percent decline.